We had a request for a basic summery of the milkmade system that could be easily passed out to people who were new to the system or thinking of joining. While I HIGHLY recommend reading through the manual as this will only be a summery and not provide instruction this should be a good place to start to get a feel for the system. Please be sure to take a look at our standards as well as the manual. milkmade is a set of prim breasts that are milk able and have a rather unique look from other breasts on the market. milkmade is a competitive game that provides personal goals and achievement as well as group based competition. milkmade is an RP tool for those who wish to have lactation play. Milk storage is based on the total amount of milk in storage tanks that you own. Life time milk intake is the total amount of milk you have drank since starting to use the system. Persistence is a total of all the milk consumed in the last 30 days. Some of these stats are used to determine another competitive rank currently called generation. Those in the top 5 generations have a bonus added to the milk they own so if someone not in the top 5 generations drinks their milk it will provide extra calcium and milk drank credit. There is also a family rank that uses the above stats as well. You do not need to be in a family to use the milkmade system but many people do because it makes cooperative play easier to accomplish. You mentioned Calcium but I did not see that in the stats list. Right so every user of the system whether they are a milk master, a drinker or a milk producer has a calcium level. The current maximum level of calcium a user can have is 10 mg. Every day each user’s body consumes 0.5 mg of their calcium. This loss is calculated on our servers at night. Drinking 1litre of milk will give you 1 mg of calcium. If you make a lot of milk (over 10L a day) then there is an added calcium loss because you are using so much of it. If you don’t drink and your calcium levels hit 0 mg then you will become sick with hypocalcemia and you can’t play until that is fixed by drinking 10L of milk or taking vitamin D.
Can you play without having the breasts? Yes! You can be a milk master with a master HUD this lets you own servants in the milkmade system, monitor their calcium and milk production, have control over their pumping milk and appearance options on the breast as well as some RLV features. Or you can just be a drinker with the 1l$ milk monitor HUD this helps you keep track of your calcium, as well as storage stats and things. If I want to be a master or drinker do I need to be in a family? and what is a milk family? No you can just be master of a milk servant (or more) without needing to be in a family as well, and you can be a drinker without being part of any particular family or under a master (but you can if you want to). A family is a way to pool resources. Storage tanks can be shared with a family as well as an SL group, many families and masters provide bonus items (Things like hormones to help speed up milk production. Bonus items are not needed to enjoy the system but can aid in reaching personal achievements faster) for their families. Joining a family can be a way to get in to the game with others to help you out. WARNING! Take a milk master or join a family with great care. You can only be released from them by the master or family owner or but purchasing an appropriate elixir. I think this covers the basics if anyone sees something I missed please let me know so I can add it! Thanks so much and happy milking! Changed the way skin appliers work allowing two different textures to be used. Update Menu button only shows when rezed on the ground to prevent confusion. Added pump menu to /5 pump command. To update your breasts rez a copy of the breast update USB and it will give you a script (it will go into your scripts folder) and the float text on the USB will say “find script given to you [mm_drop_in_breasts_to_start_update] Rez Milk Made breasts and drop the script in them to start the update”. Keep the USB rezed and rez a copy of your breasts and edit them. Put the script the USB gave you into the breasts contents via the edit window. Once it is in the breasts it will start the update process and will delete itself once done. The updated breasts will have version 1.30 in the description. You can rename them so that they are easier to find in your inventory but as some customers rename their breasts for different avatars or outfits we did not want to change the name of the breasts automatically. The USB will then say “find script given to you [mm_drop_in_breasts_to_start_update] Rez Milk Made breasts and drop the script in them to start the update” again. And you can update another copy of your breasts just as the first one if you chose to. If you do not have milkmade version 1.20 the update USB will not work correctly but you can use the version 1.30 breasts that are in the box sent with the update. If for some reason the update is not sent to you when you attach a pair of older breasts you can request the update to be sent to you via the update terminal found in world under the breast vender or you can put in a ticket and one of our staff will take care of it as soon as they are able. With this update there are now 3 old versions of milkmaid, this creates a lot of issues as people are encountering bugs that have been fixed or are looking for features that were implemented on a newer set of breasts, we can not continue to support them. We are giving a 4 week grace period for everyone to be able to update to the current version and then the old versions will be shut down. They can still be updated to current after that point but they will no longer create milk. Please update as soon as possible. 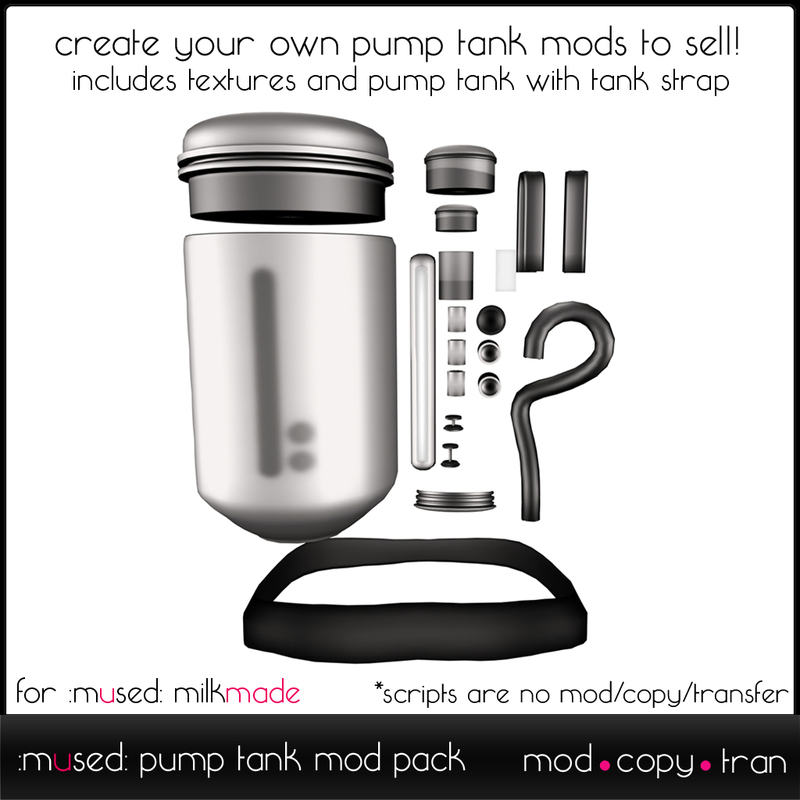 A new mod kit for developing pump tanks is now available! This kit contains all of the parts and pieces of the basic pump tank as well as the pump tank script so that you can use them to make your own pump tank for personal use or sale. As with other similar kits there are limitations on its use which you can read in detail in the notecard in the kit. But in summery don’t sell or give in full or in part these textures or objects full perm, or copy trans. You can find the kit in our in world store Here for sale with the cash cow vender for 20L of milk. So some of the questions I have been seeing with the announcement of the changes to the way milkmade gen is calculated made me think that maybe the creators’ thought process on what the stats mean and how the ranks should work should be spelled out. Now its not our intention to tell anyone how they should use the system or play the game. Its still totally up to you what you want to do with it and how you want to enjoy it but this is a little of what we are thinking. This of course is all subject to change as we see how these work out in practice, just like we changed the way servants calculated for generation points, or added persistence as a stat. This is a producer stat and the main area for producers to complete. It was also the first stat to have any bonus associated with it. Rising in this stat gives you access to new appearance features and increases your lactation rate. This is a drinker stat and one way for drinkers to compete. Originally we only had Lifetime Milk Intake but then found that did not really accurately reflect current active players so we added Persistence as well. At current there is no bonus associated with these stats. The amount of milk stored is a more general stat that anyone can compete in if they want to, however it does come at a time and linden cost and has the risk of being spoiled if the owner of the tanks does not continue to be active in the game. We knew there was a desire for the system to have a master servant component, but we wanted this to be incorporated into the game not just an after thought to accommodate peoples rp styles. It is certainly not needed but if people did want to play with this relationship we wanted there to be away for it to be part of the game. So we made Generation as a way to rank masters. This number considers storage, an investment and a risk, servants, and the players own activeness in the game, persistence. We recognized that those that did well with this would probably be working with a large number of servants and we understand the work that goes in the managing a successful group. So we added generation bonuses. This bonus does two things, it makes the top gen’s milk a little more desirable and gives an incentive to sell milk which impacts the storage stats giving more room for competition. Again anyone can play with the game how they choose to we are not saying anyone needs to focus on a stat or any stat but this is just the thinking that has gone into the way we manage the stats and any bonus we may add in the future related to them. As I mentioned in the post about the change to generation stat calculation, we were planing to allow drinking milk to cure hypo. Well now you can! You will need to drink at least 10L of milk in one shot. If you try to drink less it wont let you. For that 10L of milk you will get your hypocalcemia cleared and 2.5mg of calcium just as if you took the vitamin D supplement. If you drink more than 10L in that first drink you will have that extra added to your calcium normally. So if you drank 15L you would have 7.5mg calcium. Do note that while you will still get the extra calcium from top 5 gen milk, you need to drink 10L total from the tank, the bonus drink credit will not apply to clear hypo and the drink bonus given to drinkers from the spring forage does not work with this as you need to be unhypo to use it. And speaking of drinking, in the near future, we will also be adding the ability to remove Hypocalcemia by drinking a set amount of milk or by using the vitamin D supplement. One of the items that :mused: has made at the request of our community is the :mused: Applier Adjustment HUD. Its intent is to make editing appliers much simpler and can be used by clothing creators to easily position their textures to make appliers but more on that later. While this will work with breasts other than :mused: milkmade it is a huge benefit for milkmade appliers because of how many layers there are to adjust and try to grab to edit etc. this makes that a snap because it does all of it at once from one HUD. While made by :mused: this HUD supports a number of different appliers and is compatible with eCorp, Lolas, iboobs, eboobs, and foxbean as well as standard :mused: appliers. To use it wear your breasts and the HUD rez or wear the applier, it will apply to both the breasts and the HUD. From there you can tweak it from the HUD. You can change everything that is available to change via the edit window, repeat, offset, rotation. You can alter the magnitude of the change with the strength button. You can tint with the color selection panel or via RGB numbers put in to chat. To do that click the microphone and type /1 in chat followed by the RGB values separated by commas. It also has the ability to save five of your favorite appliers so you can switch between them from the HUD rather than needing to reapply and reedit them. The last part is my favorite, the Show settings in chat History button will out put the texture positioning and coloring data so that can be put into an applier script so that if you are making an applier you can easily get just the right tweaking on the texture so that your applier works right out of the box and will leave those who use your applier with very little tweaking to do. You can buy one for 1L$ in the mused shop here. 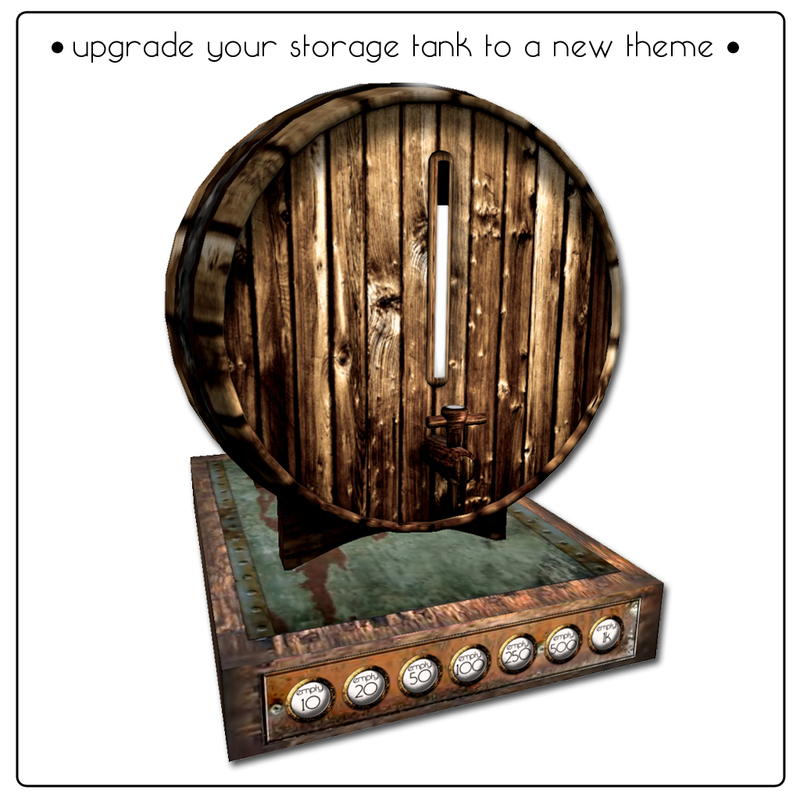 Want a new look for your storage tanks? A new cask option is available through an exchange vender. The land impact on the new cask themes range from 2 LI (10 liter cask) – 5 LI (1000 liter cask) depending on the size of the storage cask. Rez the tank you want to exchange there and touch the sign behind the preview rezzers to start the exchange process. You can also join the :mused: Creamery group to connect and socialize with other users of the “Milk Made” system, new friends and family. These invitation terminals can be found by use of the teleport link directly to the terminal.